Rent Mira Vista Golf & Country Club | Corporate Events | Wedding Locations, Event Spaces and Party Venues. Mira Vista is just 20 minutes from downtown San Francisco and yet when you are up here, you feel like you’re on top of the world. There are few moments in life as important as your wedding day. And Mira Vista provides the perfect setting to celebrate your love. 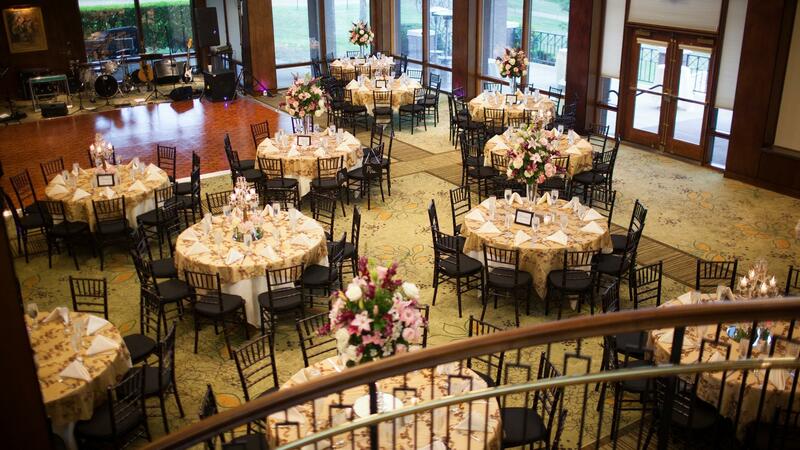 With sweeping views of the Bay Area, the surroundings will highlight the joy of the occasion. The ceremony itself can either be performed inside in the Vista Room, which features a fifteen-foot high crested bay window for the backdrop, or outside on our newly constructed Vista deck, with a vast panorama that stretches from Emeryville to San Francisco and all the way north to the San Rafael Bridge (opened Sept. 2009). And once the vows have been taken, you can celebrate in one of our beautiful banquet rooms, all with rich wood paneling and flooring, vaulted ceilings, and huge working fireplaces that evoke the glamour of bygone days. Whether you are planning a large wedding, a small business gathering, or a medium-sized celebration, Mira Vista has the perfect place to host your event. Located only 20-minutes from downtown San Francisco, Mira Vista makes you feel like you are a world apart from the big city. Our three banquet rooms boast some of the most magnificent views in the entire Bay Area. From the San Francisco skyline and Golden Gate Bridge to the Marin Headlands and Mount Tamalpais, the views are vast and breathtaking. And once the sun sets over the Bay, our warmly lit banquet rooms create an equally glorious ambience. Designed in the 1920’s by the notable Bay Area architect W. H. Ratcliff, the clubhouse is a supreme example of the English Tudor Revival. Mira Vista also provides world-class cuisine. When you walk into the Bay Ballroom, you can’t help but feel exhilarated. The extensive wall of windows provides a panoramic view that stretches all the way from the Bay Bridge to the Richmond Bridge, and on a clear day, to Mount Tamalpais. The room itself is equally magnificent with vaulted ceilings, three chandeliers, up-lit beams, and a massive gas fireplace. When it’s time to kick back, there’s a spacious 30 foot square dance floor. The beautiful Vista Deck offers views unlike any other event space. With a vast panorama that stretches from the Bay Bridge to the South, encompassing the San Francisco skyline and Golden Gate Bridge, then all the way north to the San Rafael Bridge, this venue truly offers a one-of-a-kind experience for that perfect day.